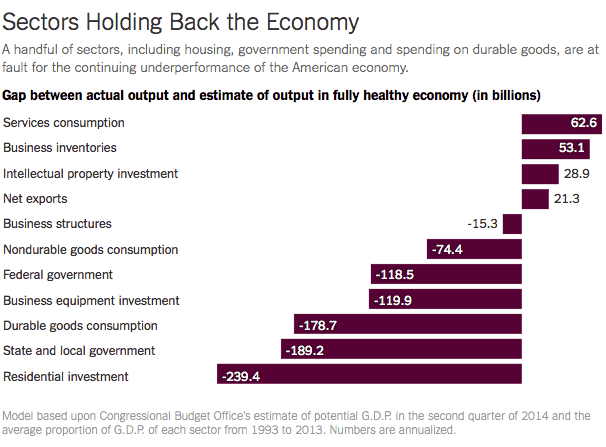 The New York Times’ Neil Irwin today identified the five sectors of the economy that are serving as a drag on growth. As it turns out, his conclusions about the reasons the economy “keeps underperforming” tie directly to what we’ve been saying about conservatives sabotaging the economy through austerity economics. “The United States is still producing around $800 billion a year less in goods and services than it would if the economy were at full health, and as a result millions of people aren’t working who would be if conditions were better,” Irwin’s article says. By projecting from historical data from the past two decades, Irwin identifies the five sectors where the gap between actual output and what their output would be in a fully healthy economy is the widest: Residential investment, state and local government, durable goods consumption, business equipment investment, and the federal government. We’ve been arguing for years that what we’ve seen since 2011 is a firm refutation of the conservative contention that cutting government spending leads to increased economic growth. Since 2011 we have seen the most rapid fall in annual federal deficits since World War II – from almost 10 percent of gross domestic product in 2009 to a projected rate of under 3 percent by the end of the 2014 fiscal year, according to the Congressional Budget Office. At the same time, many state governments controlled by Republican governors and legislatures engaged in a dramatic shrinking of spending, much of it to finance deep tax cuts to corporations and the wealthiest. Meanwhile, the spending cuts were concentrated in aid programs to low-income and working-class households, education and in government services that supplied good-paying jobs for hundreds of thousands of workers. Cuts in government spending help exacerbate the sluggishness in the private sector areas that Irwin identifies as underperforming. Without wage growth and full employment, the housing market can’t prosper. Without government investment in infrastructure, research, and green energy – as well as a growing middle class spurring consumer demand – there is a smaller market for durable goods and business equipment. If those five sectors of the economy were performing at what would be par for the past two decades, there would be an additional $845 billion in economic activity this year. “In other words, if those sectors returned to their typical share of economic potential, the economy wouldn’t just be doing well, it would be in an outright boom,” Irwin wrote. Irwin is correct to say that “there is no ‘right’ answer to how big a share of the economy each of these sectors ought to occupy.” But progressives should be comfortable in arguing that the draconian cuts in government spending that conservatives have been able to force at both the federal and state government levels have been detrimental to the economy. You will hear Republicans in the coming weeks talking about the failure of the “Obama economy,” but what we’re really living is a barely diluted version of a conservative austerity economy, a taste of the tea-party economy that awaits the nation if conservative policy absolutists are allowed a further foothold on government.